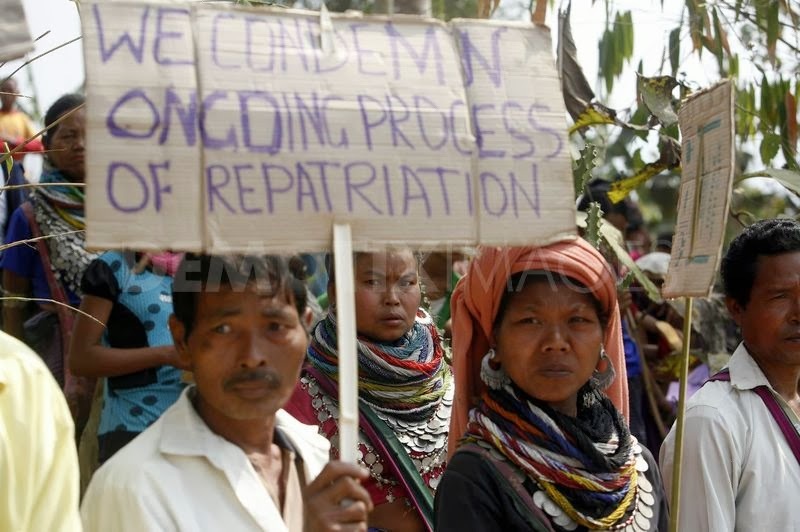 Aizawl, Jun 13 : As the Mizoram government is all set to carry out the sixth phase of repatriation of Bru refugees from Tripura, the stalemate over the cut-off year is likely to resurface. Mizo Zirlai Pawl, the state's apex students' body, has planned to identify bonafide citizens of Mizoram among the repatriated Brus, based on the 1995 Mizoram electoral roll. MZP, in its meeting today, decided to conduct the unofficial identification process at the two facilitation centres at Kanhmun and Zomuantlang. MZP, including other influential Young organisations, had demanded that the 1995 electoral roll be the basis for determining bonafide residents of Mizoram from among the refugees lodged in Tripura camps. 'Only names of those refugees enlisted in the 1995 electoral rolls of Mizoram and their descendants be repatriated to their villages. This is because large number of Brus from neighbouring states and adjoining Bangladesh could have infiltrated into the refugee camps during the past 12 years,' MZP president Lalhmachhuana said. On the contrary, the Bru refugees strongly opposed the demand of considering 1995 as the cut-off year for the repatriation of refugees. The government has planned to repatriate at least 459 families on June 17 and 18. A meeting was held on Monday evening between government officials of Mizoram and Tripura concerning transportation and security needs for the repatriation. Officials from Mizoram led by Mamit DC K Lalthawmmawia included Mamit SP, Home department officials, nodal officers and DIPRO, Mamit while the officials from Tripura included North Tripura DM Sandeep Rathod and other officials. The two sides discussed cooperation in the process of programmed repatriation. As per the arrangement made, the Bru refugees to enter Mizoram through Mamit district will be received at two places - Kanhmun and Zomuantlang. From there, they will be transported to the respective Assembly Constituency, where they lived before fleeing to Tripura. As has been reported, the 6th batch repatriation shall be self-repatriation. Official identification of those submitting their names have been done. I merely have a fugitive gaze here and endure nice to undertake to travel seeking out this periodical. created content composing hand and really cooperative net location. I foresee most of we have got got a bent to tend to tend to tend to tend to alliance bureau unit to seem for out these sorts of things, here we have got got a bent to tend to tend to tend to unit adept to recognise everything auto cash title loans chicago. I’m with the content honor and do esteem him as a directly supplier. Thanks for your efforts and you too.